A few years ago, I went to Sunbury Ohio (jut north of Columbus) for a horse show. My wife rides, and was in the regional finals. While there, I had some free time, and took a morning to explore the local connections with General Rosecrans. William Starke Rosecrans was born on September 6th, 1819, in Delaware County, Ohio. His father’s farm was on Little Taylor Run. The House is long gone. We know the rest of the story: West Point, army officer, Mexican War, Inventor, and then Civil War General. Had circumstances been even slightly different at Chickamauga, it is possible that schools would teach about the Rosecrans administration instead of the Grant or Garfield presidencies. Postwar, after a stint as Ambassador to Mexico (From which Grant removed him in 1869) Rosecrans was most famous for his time in the U.S. Congress, from 1880 to 1885, as a representative from California. 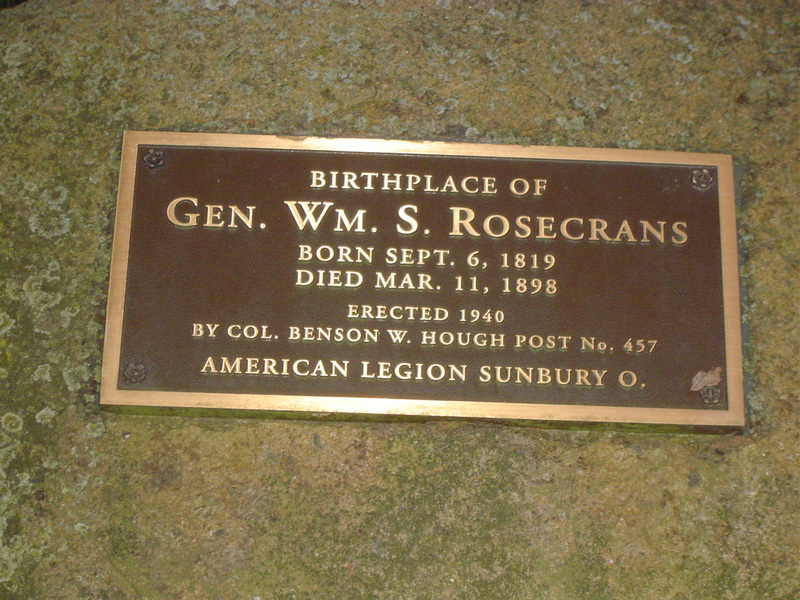 Rosecrans bought a ranch in California, in present-day Redondo Beach, and retired there in 1889 – he was also restored to the rank of Brigadier General, USA, and placed on the retired list at this time. He died there 10 years later, in 1898, and lay in state in Los Angeles. In 1902, a joint session of congress voted to transport his body east, so he could be interred at Arlington. No statue of Rosecrans exists today. The Society of the Army of the Cumberland memorialized General Thomas in Washington DC, and there was talk of a similar effort for Rosecrans, which came to naught. At Chickamauga, of course, no generals have statues; and Rosecrans’ other battlefields were not parks until later. However, there is an interesting monument to his birthplace. I stumbled across a reference to it in the Sunbury public library, and promptly set out to locate the place. I found it along (fittingly enough) Rosecrans Road, marking the site of the original family farm. It was placed by the American Legion in 1940, with a rejuvenation in the past few years. I attend a wargame convention at Columbus every year (Origins, for those of you who care) and try to make a point of visiting the General during my trip. I wonder how many others have visited the site. Merritt J. Simonds joined the 42nd Illinois Infantry on August 4th, 1862. He enlisted in Company K, a new recruit among old hands. His first combat was Stone’s River, where the 42nd lost 161 men out of about 350 engaged. Here are two pictures of Merritt, one taken before his enlistment and a second taken in the summer of 1863. the strains of war and campaigning are clearly evident in the latter. At Chickamauga, the 42nd first entered action late on September 19th, attacking through Vinyard Field only to be repulsed with heavy loss. At about Noon on September 20th, the 42nd – along with the rest of Sheridan’s Division – was moving northeast past the Widow Glenn house, hurriedly moving into action. They were struck by Hindman’s Division, and faced another desperate engagement. Within a short time, the Federals were driven from the field. Again their losses were fierce: 143 lost out of 305 engaged. Merritt Simonds was one of those casualties. Below are his diary entries for the days following his wound. Simonds laid there two more days, until he was finally removed to a Confederate field hospital the next Saturday, the 26th of September. On Wednesday the 30th, Simonds was allowed to return to his own lines with hundreds of other badly wounded men, transported in an improvised ambulance train to Union hospitals in Chattanooga. He was in desperate condition. On October 8th he wrote a note to his father, describing his ordeal and his condition, but still expecting to recover. His leg took a turn for the worse, however. Merritt died on October 29th, as a subsequent letter from messmate George Wright revealed. He was buried in Chattanooga. 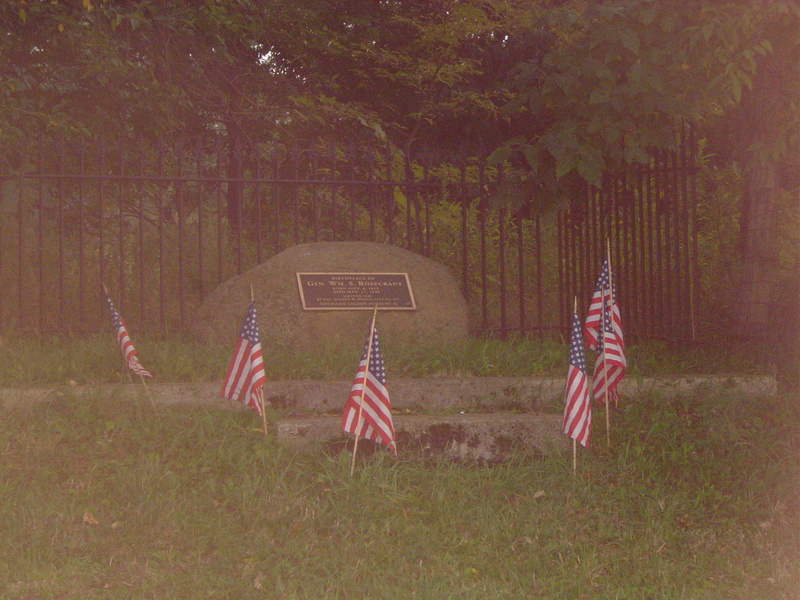 Dr. William Glenn Robertson has taken many classes of soldiers to the regimental marker for the 42nd Illinois, there just north of the Wilder Tower, in the course of his staff rides. It is worth a moment to reflect, as we discuss tactics and generalship, revere one commander or revile another, on who pays the price when armies collide. Recently I went back to VMI. It has been a while since I was there last, especially to look around. Everything’s different, and yet nothing has changed, if you know what I mean. There’s a new barracks (Cell Block C – cadet humor is one of those unchanging items) where the PX and student center used to be, but overall, the place seemed frozen in time. When I was last in Preston Library the stacks were dark, metal enclosed spaces. Now the floors are open, airy, light and carpeted. The library was completely redone in the late 1990s. I was there to do some research on the battle of New Market. VMI has a premiere collection of source material on the subject, as you might imagine, and housed in a proper archives, to boot. A change for the better, I think. VMI’s Civil War Past is traditionally associated with Virginia, and Lee’s Army. 13 of the 15 colonels in Pickett’s Division on July 3, 1863, were Institute Grads, or so goes the legend – I confess I haven’t looked it up. 21 Alumni or faculty – including the most famous, Stonewall Jackson – became Confederate Generals. But there is a Chickamauga connection. I know of three, in fact. The first is Colonel Alfred J. Vaughan, Jr. Vaughan graduated in 1851, standing 15th out of a class of 29; he was a well traveled civil engineer before the war. Having settled in Mississippi, he rapidly recruited a company for the war, but not finding a place in a Mississippi Regiment, he took his nascent command into Tennessee, where they filled out the ranks of the 13th Tennessee Infantry. Vaughan was soon elected Lt. Col., and then promoted to full Colonel that winter. He was wounded at Shiloh, fought at Perryville and Stones River, and led his command into the fight at Chickamauga. On the night of the 19th, Preston Smith’s Brigade (to which the 13th Tennessee belonged) supported Cleburne’s division in a night attack and stumbled into the 77th Pennsylvania. Smith was killed in the ensuing confusion. Vaughan assumed command, eventually rising to Brigadier. Lieutenant Colonel Abraham Fulkerson commanded the 63rd Tennessee. He was in the VMI class of 1857, graduating 12th out of 23; and had also been wounded at Shiloh while serving with the 19th Tennessee. He subsequently helped raised the 63rd and was elected Lt. Col.; effectively running the regiment due to the ill health of the actual Colonel, Richard G. Fain. Fulkerson saw no action on the 19th, but was given the grim task of assaulting the Snodgrass Hill portion of Horseshoe Ridge late on the 20th. His regiment was cut to pieces by the controlled fire of Harker’s Brigade, supported by Hazen and Frank Smith’s Battery I, 4th US Artillery. The Tennesseans lost 48% of those engaged, including Fulkerson, badly wounded in the left arm. the last connection comes with William Young Conn Humes, also class of 51. He was a distinguished graduate, standing 2nd, and was a lawyer in Memphis before the war. His light would not shine until later in the war; at the time of Chickamauga he was serving as chief of artillery to Major General Joe Wheeler, though in November he was given a brigade, and eventually rose to Major General. Sorry to be so remiss here. Travel and work tend to eat up a lot of time. Here are the final details for the 2010 Study Group. Hope you can all attend, and please feel free to forward or re-post these details to any interested parties. CCNMP Study Group 2010 Seminar in the Woods. Mission Statement: The purpose of the CCNMP Study Group is to create a forum to bring students of the American Civil War together to study and explore those events in the fall of 1863 that led ultimately to the creation of the Chickamauga-Chattanooga National Military Park. The intent is to use the indispensable resource of the park itself as an outdoor classroom to promote learning and study of the battles for Chattanooga, and to build interest for an annual gathering that will in time examine all aspects of the Campaigns for Chattanooga. Additionally, we hope to bring students and serious scholars, both professional and amateur, to the field for to share insights and knowledge about the battles. Start and end at the Visitor’s Center parking lot. Lodging and Meals: Everyone is responsible for their own lodging and meals. There are many hotels in the greater Chattanooga area, for any price range. The closest are in Fort Olgethorpe, Georgia, with the least expensive in Ringgold. Each tour is designed to leave at least 90 minutes for lunch, and there are several family and fast food restaurants within minutes of the battlefield. There are designated picnic areas near the Visitor’s Center, for those who wish to bring a lunch and eat on the field. Cozzens, Peter. This Terrible Sound. University of Illinois, 1992. The best modern study of the battle. Gracie, Archibald. The Truth About Chickamauga. Morningside, Reprinted 1987. For the veteran Chickamauga student only. ——————-, A Deep Steady Thunder: The Battle Of Chickamauga. Abilene, Texas. McWhiney Foundation Press, 1998. Concise but very useful account of the battle, designed as an introduction to the action. 100 pages, very readable. Powell, David with Cartography by Dave Friedrichs, The Maps Of Chickamauga. Savas-Beatie, 2009 is now available as well. Please also note that this fee is NON-REFUNDABLE after February 1st, 2008. Once we are committed to the bus, we will be charged the booking fee. Final note: Last year we raised a sizable amount of money over and above the cost of the bus, and were able to contribute a number of new titles to the CCNMP research library, mostly regimental histories of recent vintage. The park currently does not have operating funds allocated for these kinds of acquisitions, and depends entirely on donations to fund library additions. I feel that this is an ideal use for any excess funds we raise, in keeping with the “study group” mission.